Some of the most appealing Bay Area destinations have their forefathers to thank. Take the city of Saratoga — population 30,000. In the mid-1950s, locals saw something that alarmed them. Sprawling growth from nearby San Jose was threatening to wash over the mostly agricultural community. “Keep it rural” was the battle cry for incorporation that helped preserve the rural charm we see today. The perfect getaway starts with a stay at the Saratoga Oaks Lodge. Perched on what was once an old toll road, this boutique inn hugs the hillside at the edge of the main street, Big Basin Way. The bungalow suites are set back on the arboretum-like property, yet it’s a short stroll to village wineries, fine restaurants and eclectic boutiques. Saratoga’s charm is like that of a New England village, where merchants greet visitors with warmth and locals are treated like old friends. The most recognized property in Saratoga is not only a grand concert venue; it’s an intriguing piece of area history. The Mountain Winery was French winemaker Paul Masson’s “vineyard in the sky” when he built his château high above Saratoga in 1905. It’s easy to picture the glamorous soirees that must have been held here, with wine flowing as freely as the mineral springs for which the town was named. 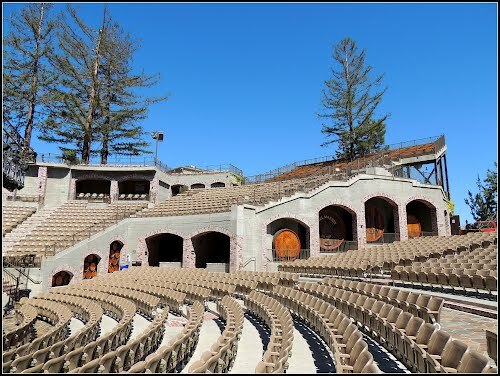 Today, Mountain Winery is one of the Bay Area’s best concert venues, with a 2013 schedule that boasts everyone from Garrison Keillor to the Beach Boys. Equally as charming, albeit much smaller, is a second landmark winery in Saratoga — Cooper-Garrod. Still family-owned, the Garrods bought this land in 1893, and you can still hike or horseback-ride high among the vineyards overlooking the Silicon Valley. The equestrian center is next to the winery and makes Cooper-Garrod a unique destination. In keeping with Saratoga’s rural nature are some of California’s most celebrated places to hike. Big Basin Redwoods (California’s oldest state park) and Castle Rock State Park are legendary, and many backpackers enjoy hiking the Skyline to the Sea Trail, linking the two parks as you descend from the coastal ridges to the beach. Along the way you’ll see towering redwoods and mountain view vistas that stretch to the sea. Culturally, this small town has much to offer. Concerts and other events are regularly held in the Tuscan-style Montalvo Arts Center, and Saratoga has its own classic Japanese garden — Hakone — terraced with koi ponds, a tea house, bamboo grove and meditative walking trails. History has been good to Saratoga. Thanks to a small group of preservationists, tourism will always be one of its strong suits.